Delightful Little Mess: Fracking Blight! It's one thing to have to deal with little aphids on your plants but mealybugs (not related to mealworms) constitute a true blight! These tiny little bugs have a hard exoskeleton that makes them relatively impossible to kill when they go after your indoor plants. They nibble along areas where leaves and stems connect along with along the stems/leaves themselves essentially cutting the extremities of the plant off from it's nutrients and water. Outdoors, the solution is to release ladybugs that will each eat about 100 mealybugs a day... Woot! But indoors, you either have to resort to horticultural chemicals or detergents that can kill your plants as well. You can also use things such as rubbing alcohol to clean the leaves and stems of your plants in a mild infection. However by the time you notice the bugs, it usually is due to your plant dropping leaves and noticing white fuzzy patches on the leaves and stems. This fuzzy white sap is secreted by the bug to protect itself and in the case of female bugs, it can contain their offspring. 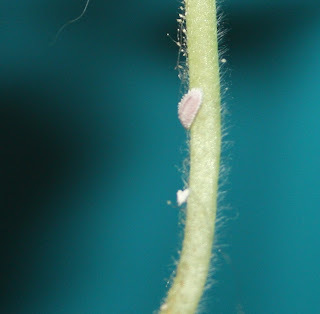 At this point, the plant has usually been coated by the bugs and the only way to save the plant is to take a clipping that is uninfected and try to root it. And it should be noted that any plant brought in from outside can be infected with these nasty little beasts. So why all this talk about nasty parasitic bugs? This past weekend I found that one of my favorite plants that I got last year was infected (see all photos above). Sadly, just a week prior I was going to start trimming the dead bits off and had not noticed the bug at all. You might say, well maybe you didn't notice it bc you didn't know what it looked like. Sadly no, I know it quite well as it killed two of my other plants last fall and if I would see anything white on a leaf, I would have freaked out as I did saturday. As with the last time, I had to sacrifice this white and pink geranium to the trash gods after I took a little snipet from it's clean side to try to root. I just hope that I caught this before any of the gnat like males flew off to kill the rest of my houseplants. Anybody else ever find an uninvited pest killing off your houseplants in the middle of winter when there should have been no exposure to insects? What did you do to kill them off? Or did you just end up having to get rid of the plant?